For the person who loves color, this bold pendant is the perfect gift. 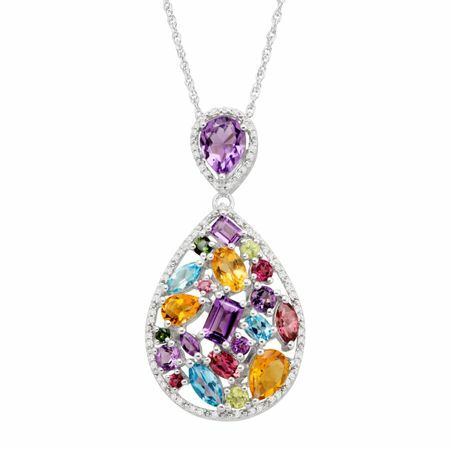 A total of 5 5/8 ct natural green and pink tourmalines, light amethysts, citrines, and peridots in a variety of cuts are splashed along the face of this teardrop-shaped pendant, outlined with round-cut diamonds totaling 1/5 ct and crafted in sterling silver. Piece measures 1 9/16 by 5/8 inches. Comes with a sterling silver 18-inch rope chain with a spring ring clasp.